Episode 28: Consolidation in Web Analytics with John Lovett | Beyond Web Analytics! In this episode, the Beyond Web Analytics team talks with John Lovett, of Web Analytics Demystified about consolidation in Web Analytics. The group discusses the major acquisitions and mergers in the web analytics industry over the past 12 months. The conversation moves from biggest surprises about the mergers, what the future may hold for IBM with it’s recent moves, and what impact these mergers might have on the industry as a whole. John Lovett, Senior Partner Web Analytics Demystified , is widely recognized as a web analytics industry luminary who has impacted the analytics community through his research and thought leadership. As a veteran industry analyst, Mr. Lovett is often called upon to present at events and frequently quoted in mainstream media because of his deep knowledge of web analytics issues and intimate familiarity with measurement technologies. John Currently serves on the Board of Directors for the Web Analytics Association and is an active member in the Research and Standards Committees. 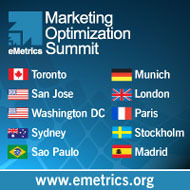 This article was posted in Podcasts, Web Analytics and tagged Coremetrics, IBM, Omniture, Unica, Web Analytics. Bookmark the permalink. Follow comments with the RSS feed for this post.Post a Comment or leave a trackback: Trackback URL.